Yalung Ri (5630m) Peak is a trekking peak situated in Rolwaling Valley in the east-central Nepal, near Tibet/China border. 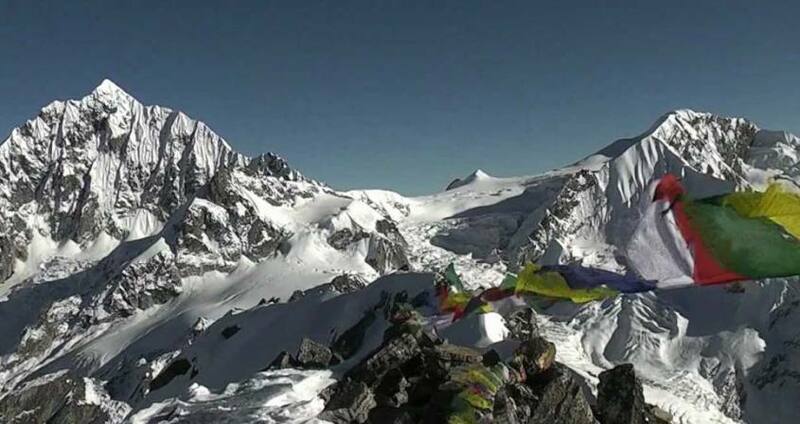 Ramdung (5930m), Chugmage (6259m), Chobulse (6689m) are other trekking peaks close to its vicinity. Yalung Ri is relatively an easy peak to climb as mountaineers will have to make their way through rocks and ice and walk on glaciers. The base camp is set up at the height of 4750m; it takes around 4 hours to reach the summit from BC. The journey to Yalung Ri is an exciting one involving quite a few days of trekking in the isolated, pristine natural region of the Himalayas. Singati, Suri Dhoban, Jagat, Simi Gaon, Kelchey are some of the settlements you will pass by. Nagaon Village at an altitude of 4183m is the last village before the summit. Climbers will have to retrace the same trail on their way back. Those climbers and trekkers with additional time have the option to take the Tso Rolpa trail on their return. This entails crossing Tashi Lapcha pass (5755m), one of the highest and difficult Himalayan passes and drop down to Namceh Bazar in Khumbu Valley. Along the way you will be able to enjoy the supreme Himalayas, beautiful flowers, local hospitality and pristine wildlife. One of the advantages of choosing Yalung Ri is that you are not required to take peak permit to climb the mountain. Nevertheless mountaineering equipment is a must. Pink Mountain Treks & Expedition has a team of experienced guides and climbers who have climbed Yalung Ri and trekked in Rolwaling and Khumbu Valleys. Day 20:Fly from Lukla to Kathmandu. Day 20Fly from Lukla to Kathmandu.You can extend your trip in Nepal to explore the Jungle safari in Chitwan National park or Buddhist Pilgrimage trip to Lumbini, Birthland of Buddha or other part of Nepal's Trip or Can take your Flight to your destination. Day 21Fly out. Pink Mountain Treks and Expedition's representative will drop you at airport before Three hours of your flight schedule.